This cardigan is meant to be customized! All of the stitch counts listed are for a 40 inch bust measurement with lots of positive ease to fit a 34/36 inch bust. Because the body of the sweater is rectangular with no shaping except for the v-neck decreases, all of the measurements can be customized for a smaller/larger/different fit. 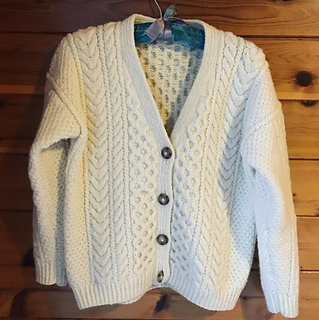 The cardigan can be lengthened over all by simply knitting more rows before beginning the v-neck decreases. The body can be widened simply by casting on more stitches and increasing the number of double seed stitches on either end of the body (or by adding more cable columns). The reverse is true if you wish to decrease the width of the garment. Be aware in your calculations that cabled stitches are compressed and will not add as much width as a regular stockinette or double seed stitch. The v-neck decreases can remain the same and the only difference will be the overall width of the garment. If you wish to add cables to increase the width of the garment, consider also widening the double seed stitch columns as well. You may repeat cables from the pattern, or add something new like a braid! Increasing the honeycomb columns is also a great option. The sleeves can be made wider or narrower a couple of ways. You can increase or decrease the number of stitches cast on at the wrist, altering the entire sleeve including the circumference of the wrist. Or, you can increase or decrease the number of stitches between sleeve increases. This will change the rate at which the sleeve circumference is increasing. This is a good option if you want to knit a sleeve that is either more fitted up the arm, or widens more dramatically making more room at the underarm. 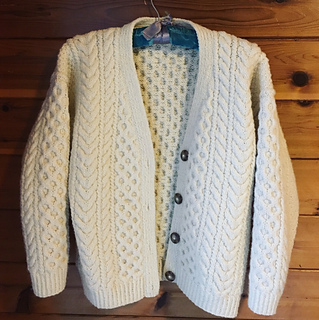 The cardigan shown increases two stitches at either end of the sleeve every 6 rows. You could make a narrower sleeve by increasing every 8 rows, or a wider sleeve by increasing every 4 rows. The sleeve will be attached the same way regardless of the width at the underarm. The button band is knitted separately and sewn on with mattress stitch. Should you wish to attach a different type of button band (a picked-up band, for example), you may do so! All pieces are knitted flat and sewn together at the seams with mattress stitch. If there are any mistakes in the pattern or in any of the charts, please let me know!